A disaster official said the death toll from Sunday's earthquake was at 16. JAKARTA — Efforts were under way on Monday to rescue several hundred trekkers stranded on Mount Rinjani on Indonesia's Lombok Island, a day after a powerful 6.4-magnitude earthquake struck the popular tourist destination, a disaster agency official said. Sutopo Purwo Nugroho, spokesman for Indonesia's disaster mitigation agency, said on Twitter late Sunday that out of 820 people who were on the slopes of the volcano when the quake struck, 246 had been successfully evacuated. The news portal Detik reported that two helicopters had been deployed to take the trekkers off the mountain and distribute food. Asdiyanto, an official at the North Lombok Disaster Mitigation Agency, said: "The latest information from the team in the field is that today all the families stuck on Mount Rinjani will be evacuated via the Sembalun trail. "This is being handled by the management team from Mount Rinjani National Park," said Asdiyanto, who, like many Indonesians, uses one name. A magnitude-6.4 earthquake is considered strong and capable of causing severe damage. 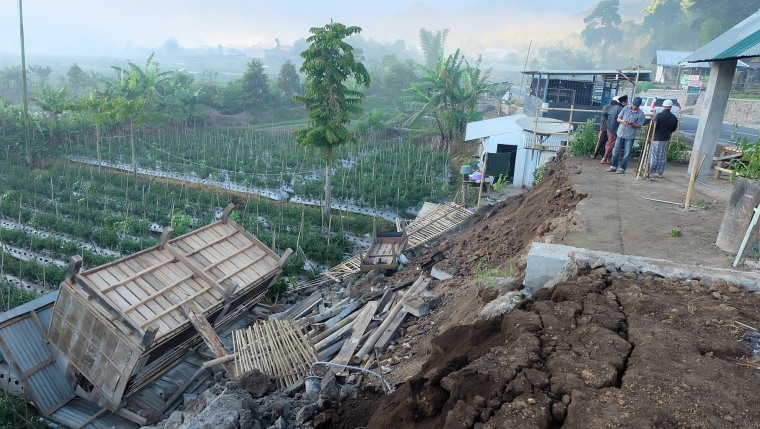 The Lombok quake, which struck at 6:47 a.m. (8:47 p.m. ET Saturday), was only 4.35 miles deep, a shallow depth that would have amplified its effect. It was centered 30 miles northeast of the city of Mataram, according to the U.S. Geological Survey, but it was also felt strongly to the west on the neighboring island of Bali, Indonesia’s top tourist destination. Earthquakes are common in Indonesia, which is on the seismically active"“Ring of Fire" on the rim of the Pacific Ocean.